We found it interesting that Amazon guru Jeff Bezos is now reportedly worth just over $60B. That makes him about $5B shy of becoming the richest man in the world according to Bloomberg. As if that weren't enough to make your head spin, consider that Amazon itself has grown so much that its market capitalization is now twice the size of Walmart. Put another way, Amazon is 2x the size of Walmart in value. That is a lot of growth over the past 20Ys. Speaking of growth, things are a bit different over in the banking industry where regulations and restrictions reign supreme. In the current market it is tough for community bankers to grow revenues substantially, so many are looking to improve their efficiencies to stay competitive. S&P's latest bank market report found that banks with less than $1B in assets reported a median efficiency ratio of 69.2% at the end of 2016. While low, this is the highest of all institutions so there is work still to be done. For the math geeks in the crowd, recall that the efficiency ratio is calculated by dividing noninterest expense by the sum of NIM and non-interest income. Community banks across the board are trying to drive costs down through bold cost-savings efforts, according to S&P research. Community banks large and small, are getting more creative about finding ways to squeeze more efficiency out these days. One tactic is reviewing and re-evaluating vendor contracts, with an eye to get more bang for the buck. Given community banks' reliance on third parties, contractual changes can add up to big savings and better efficiencies in some cases. Also, for banks that are loath to close branch locations, you can realize better efficiencies by re-distributing your most skilled and valued loan and advisory staff across various locations perhaps. For example, a business-focused bank might consider changing the schedule for commercial lending personnel to visit different locations depending on how busy each branch is (and what the customer mix offers). It may also be worthwhile to review seemingly well-established end-to-end processes and workflows. Streamlining can have a potent effect on the bottom line and help ensure your bank is as effective and efficient as possible. Process improvement methodologies can not only save money in the short term, but can also create a culture wherein employees feel empowered and motivated to find new opportunities for improvements. While technology integration is increasingly becoming a necessary part of community banks' operations, to reduce efficiency ratios banks must also look for new technologies and systems that actually improve overall operations. Conducting process mapping exercises before a new technology platform is embraced can help your bank better prepare and eliminate unnecessary or redundant activities. Fresh eyes may also help your bank find ways to optimize things where you didn't think it was possible. Looking at your vendor contracts, how to leverage your experienced staff and reviewing work processes and technology will give you a good start. 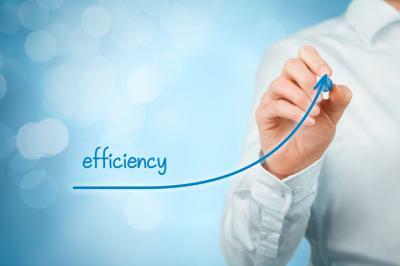 There is always room for improvement and refinement when it comes to efficiencies. Yields blipped up 1bp as jobless claims remained low and the Philly Fed report came in strong. Total household debt hit a new record of $12.7T as of the end of Q1, a higher level than that reached pre-crisis in 2008. Pundits said the data points to an increased risk level for banks as future defaults could occur. By category the debt was: mortgages (68%), student loans (11%), auto (9%), credit cards (6%) and home equity (4%). 1) Crestmark Bank ($913mm, MI) will acquire commercial equipment leasing company Allstate Capital (FL) for an undisclosed sum. 2) Sandy Spring Bank ($5.1B, MD) will acquire WashingtonFirst Bank ($2.0B, VA) for about $488.9mm in stock (100%). Fitch rating agency said the multifamily sector is seeing signs of a growth plateau, after charging higher for almost 20Ys. A former Bank of America SVP and her husband, who both worked in the global wealth and investment management division, have been charged with embezzling $2.7mm using donations to nonprofits. Prosecutors say the pair stole funds from a marketing budget, then transferred it to nonprofits in Boston and Atlanta in amounts under $50k under an arrangement where the nonprofits sent back portions of the funds to an account the thieves could access. Studentloans.net research finds the number of Americans carrying student debt is about 44mm. Fed New York President Dudley said that if the economy continues to evolve in line with their expectations, the Fed will begin to gradually normalize the balance sheet later this year or next year. The OECD reports it now sees steady expansion for the US this year but does not see a faster expansion as tax cuts and spending increases are less likely now. Fitch rating agency projects the US cyber insurance market could reach $14.0B by 2022 vs. $1.3B as of the end of 2016.